Brittle Stars are pretty cool. These tiny animals usually hide in the reef during the day and crawl out at night to hunt. This Orange Banded-Arm Brittle Star was only about 1.5-inches across, from the tip of one arm to the tip of an opposite arm. Like other Brittle Stars and Sea Stars, this Brittle Star has five arms that branch out from a central body disk. The body disk of this Brittle Star was only one quarter of an inch across. This Orange Banded-Arm Brittle Star is unusual, meaning I couldn't find a description of it in any of my field guides. There are some similar Brittle Stars that are many different colors, but none that were orange like this one. Other similar Brittle Stars described in my field guides are red, green, brown, or gray. But there is no argument that this Brittle Star was orange. Notice the thin white bands around its arms, giving it the name of a Banded-Arm Brittle Star. Also notice how its body disk is thick and cone shaped, and that the body disk is covered by small white spots. 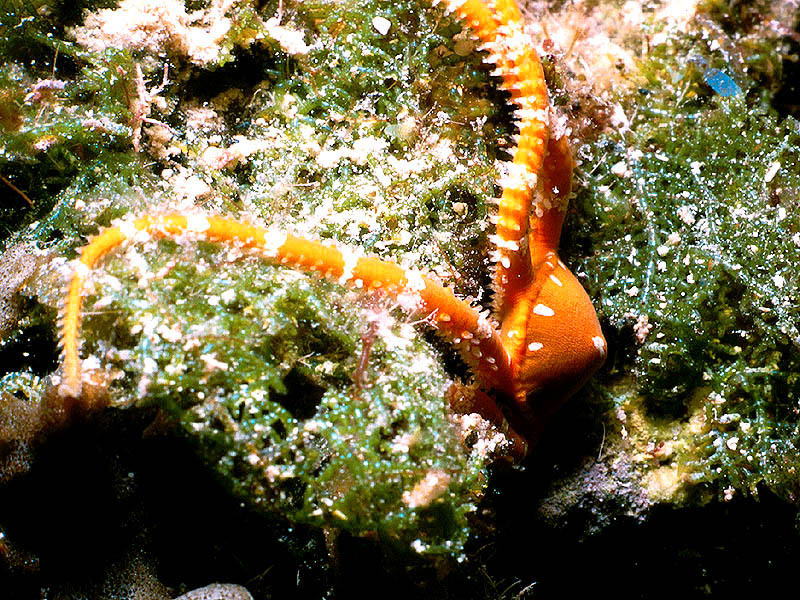 Brittle Stars are tiny, but they are surprisingly fast. They can crawl several inches per second across the surface of the reef. Also notice the thick patch of green alga surrounding the hole where this Brittle Star had spent the day hiding. ReefNews photographer Jonathan Dowell took this photo using a Nikonos V camera with a 28 mm lens and a 1:2 macro extension tube with a Nikon SB 105 strobe. NO CORALS WERE HARMED TO MAKE THIS PHOTOGRAPH. Jonathan was extremely careful not to bump into the coral polyps with the camera or the extension-tube framer, as any little bump could crush and kill these fragile animals. 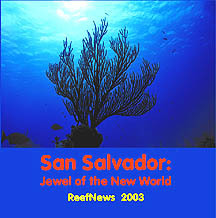 This picture first appeared on the ReefNews CD-ROM, "San Salvador: Jewel of the New World." Order your own copy of this educational CD-ROM from the ReefNews Online Catalog. Copyright © 2003-2004, ReefNews, Inc.